In the manual recommend to mount the generator in horizontal and forbidden upside down, but, could i install it vertically?, with the front facing down, i prefer this config due to mi current generator have this config and I can adapt it more easily. I suppose in this config there are no problem with the refrigeration and I could clearly see the led for the error / fault status inside the cabinet. Equipment in 19 inch racks is almost always mounted horizontally. I have performed temperature testing only in the horizontal position. At this moment I can therefore not guarantee that mounting it vertically will not cause problems. Therefore, I advice not to mount vertically until I have tested it. In particular, there is one small heatsink inside that relies on natural convection (it does not use a fan), and convection only works horizontally. I will test it and let you know. What about turn from recomended on right or left side ?Could you also check these mounting positions? I've been looking into the mounting questions. 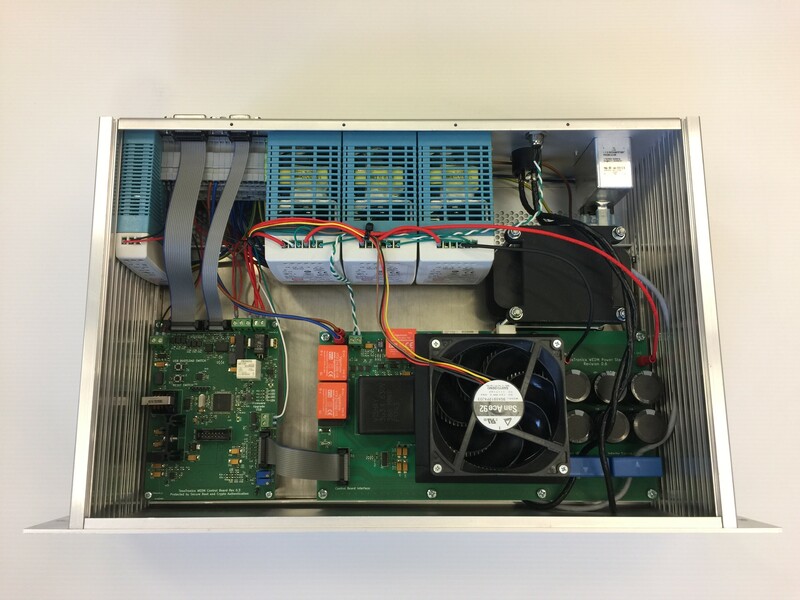 The BX17 uses 4 internal DIN rail power supplies. The 3 big ones on the right are cooled by a fan from the bottom, so these do not rely on convection. The small one on the left relies on convection, so this one might get too hot if not installed horizontally. However its full load is never used, unless the 12V warning output is heavily loaded. So I think mounting the BX17 on it side will not cause excessive heating, however it will rise the temperature and will therefore negatively imact product lifetime. So only mount the BX17 on its LEFT side if there really is no other option to mount it. Note that the BX17 was designed to be installed in a 19" standard rack. These racks always require horizontal installation of the 19" submodules.